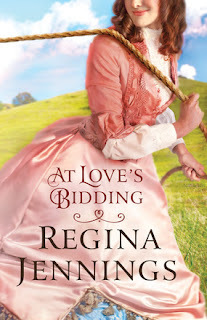 This is the first time reading a Regina Jennings novel and the plot drew me in. At Love's Bidding features auction house and a missing painting - very intriguing. Our main character Miranda has a bit of a coming to age story as she finds her voice and starts to figure out how to live the life she wants. Then we have Wyatt who has a painful history. He has to decided to find out who he truly is and if he is willing to accept what that means. This was a cute story. It was a little slow to get into but once I was a few chapters in I found myself wanting to read more. I think Jennings rushed it a little and could have developed the two main characters a bit more to make the story flow a little better. I was also disappointed a bit by the epilogue which gave us more questions than answers or at least it felt that way to me. Even with that it was a nice read and perfect to dive in to over the long holiday.